Today we chat with one of the top freshmen girls in California, Cupertino HS runner, Caroline Gee (picture courtesy of Hank Lawson and www.lynbrooksports.com). This past Cross Country season, Gee made her presence felt early in the season with a victory at the Earlybird Invitational at Toro Park. Her next major statement came at the Stanford Invitational where Gee finished a narrow 2nd behind Gillian Meeks of Gunn HS in an impressive 17:43. 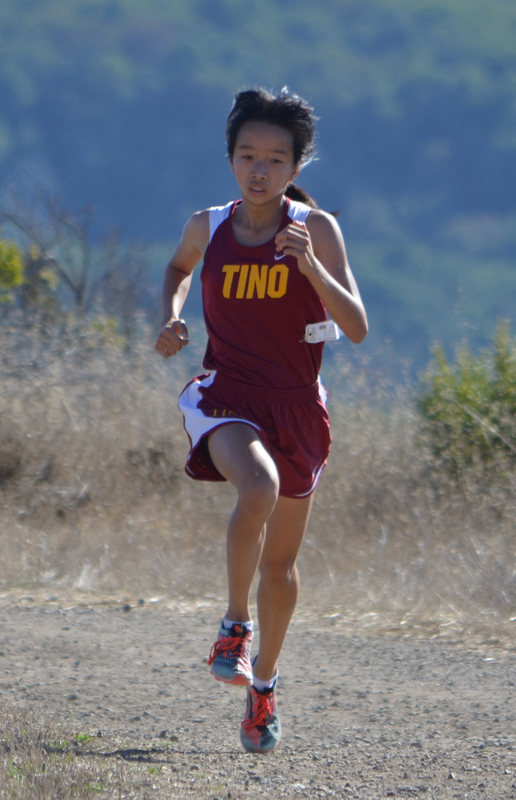 She won the SCVAL El Camino race at the Crystal Springs course in 17:46 and followed that up with a 2nd place finish at the CCS Division I race, once again, behind Meeks. She finished an impressive 10th place at the California state meet to cap a very successful freshman Cross Country season. Following the season, Gee was voted the All NorCal Freshman of the Year. 1) How old were you and what led you into running? I first ran track in 6th grade since I was always one of the faster girls in PE class, and I also loved running long distances in my free time. I wasn’t really committed to running until high school, since I was more focused on soccer. I don’t think I realized my potential until I placed second in County Finals in 8th grade. I felt that I could do better in the longer distances, so I decided to try XC in high school. I was a bit hesitant about this, though, since I knew that it would be difficult to balance XC practices with soccer. 2) What other sports have you participated in besides Cross Country and Track and Field? When I was younger, I participated in gymnastics and swimming. I also used to ski a lot, but in middle school I focused mainly on soccer. 3) What were your track and field personal records before high school in 800, 1600 and 3200? Other running experience? The only track event I ran in middle school was the 1600. My PR in the mile was 5:20, which I ran in eighth grade at County Finals. Last summer, I ran a few 5k races for fun with my mom. 4) Tell us a little about your Cupertino HS teammates and coaches and how they have helped you transition from middle school to high school? My teammates at CHS are super nice and supportive. Practices with the team are really fun and I always look forward to them. Coach Armstrong (Paul) is a great coach and has helped me to take running more seriously. He’s motivated me to make goals and work hard for them. 5) Highlights from your just completed XC season? What did you learn from your race experiences? Proudest accomplishments? I think I’m most proud of my Stanford Invitational time of 17:43. Even though I didn’t finish first in my section, I broke the freshmen record, and I think I exceeded everyone’s, and my own expectations. I’m also proud of my Crystal Springs results. I was also really excited to have qualified for state. I’ve learned to be mentally stronger near the end of my race, because that’s when I would sometimes lose focus. 6) What does a typical week look like for you in terms of training? What is the length of your longest run? What do you enjoy the most about practices? Coach Armstrong mixes up the workouts with track workouts and long runs. We always have 7 AM runs on Saturdays and rest days on Sundays. My longest run is about six miles. Practice is always a lot of fun. I love talking to my teammates and sweating out during the workouts. 7) Favorite XC race? Favorite XC course? Favorite XC workout? Favorite track distance? Favorite long run? What do you enjoy doing during your free time? My favorite course would definitely be Crystal Springs. The distance feels perfect, and it has a good amount of hills. It’s a fast and challenging course. My favorite XC workout is when we do a long road run. It always feels really good and relaxing after a long school day. My favorite track distance is the 1600, but I’m excited to try the 3200 because I have never raced it before. In my free time, I love reading, running long runs with my family, playing with my pets, and hanging out with friends. 8) What races are you looking forward to this upcoming Track and Field season? What do you feel will be your best race distance? I’m looking forward to running the 3200 because I’ve never run that distance before on track. I think either the mile or the two-mile will be my best distance. 9) Looking back at your past XC season, what would be your advice for a freshman next season who may have similar type success? My advice would be to don’t get injured! Injuries, even something as little as soreness, can set you back and can be extremely frustrating. Also, always work really hard and set big goals for yourself.